Earlier this summer my wife, kids, and I spent a week in Southern California. First stop was the Van Eaton Galleries in Sherman Oaks, which was featuring a collection of Disneyland memorabilia. 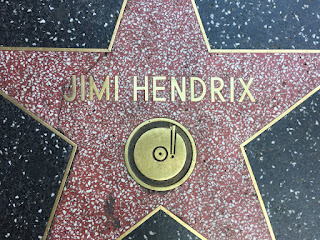 After driving down Ventura Boulevard and through the Cahuenga Pass we arrived in Hollywood. We stayed at the Motel Six Hollywood, offering no frills lodging at a reasonable price in a great location. And swans. 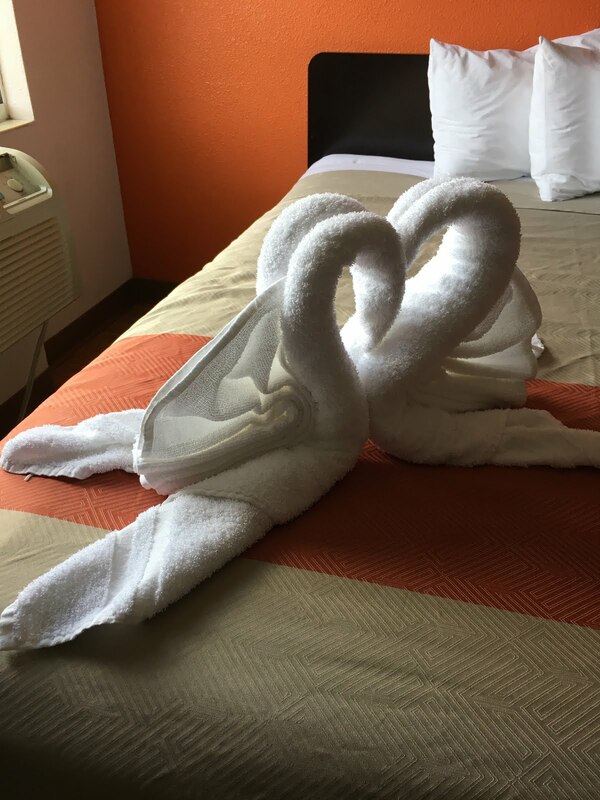 Can't forget the swans. 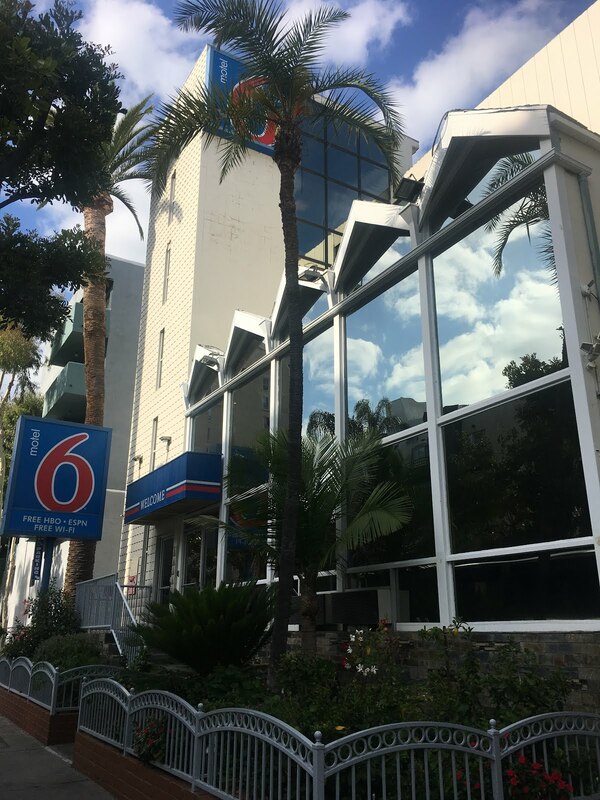 Parking costs extra at almost every hotel in a large urban area, including the Motel Six Hollywood. Make a reservation ahead of time, not just for your room, but for a parking space. The parking lot on the lower level. Limited space means stacked parking. They have a someone on duty 24/7 and did a good job getting us in and out (later that evening) quickly. View from the 5th floor, looking south towards Hollywood Boulevard. Across the street is the (1928) Fontenoy, a historic 13 story apartment building. According to a Google review, this is where Johnny Depp lived when he first moved to Los Angeles. Across the street, the (1928) J.J. Newberry Building on the left. J.J. Newberry's was an American Five-and-Dime store chain in the 20th century originally founded in Stroudsburg, Pennsylvania. The architects of the Hollywood J.J. Newberry's, now Hollywood Toys and Costumes, created this colorful example of Art Deco at its best. The "Zig Zag" patterns of chevrons and squares in colorful aqua and gold highlight the over-sized industrial windows of the upper stories. On the right the (1935) Kress Building on the right. Designed and built as a part of the S. H. Kress retail chain. Beginning in 1949 this Art Deco structure housed the world headquarters of the internationally known Frederick's Of Hollywood lingerie chain for 59 years. 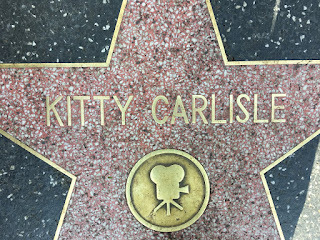 In July 2008 The Kress Hollywood Night Club and Kress Restaurant opened for a few short years, closing in July 2011. 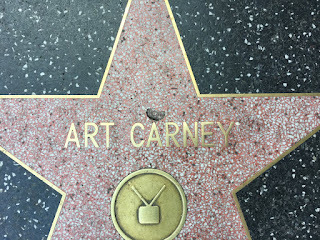 To the east, The Second City Hollywood, a comedy club housed in the historic (1927) Spanish Colonial Revival Building, featurinv flamboyant "Churrigueresque" ornamentation. Looking west down Hollywood Boulevard. The Hollywood Walk of Fame highlights 5000 celebraties from film, TV, and music. 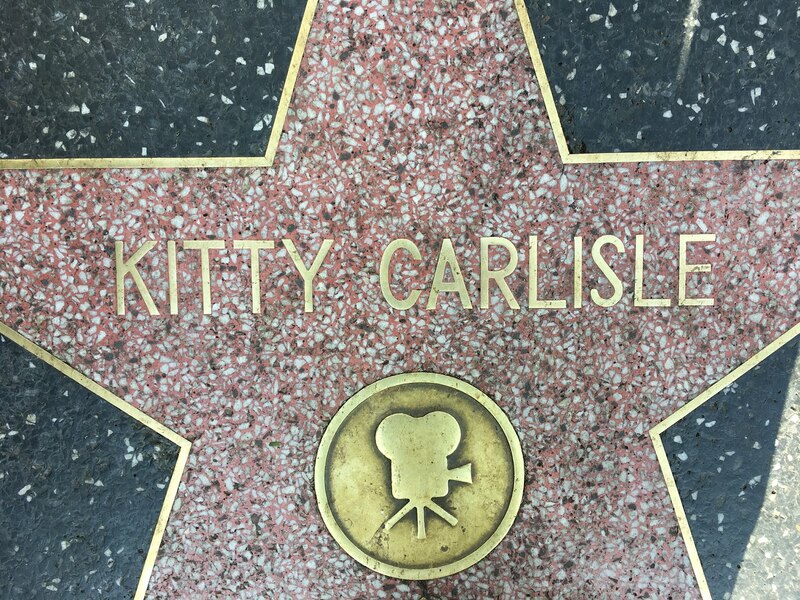 Above, actress Kitty Carlisle. 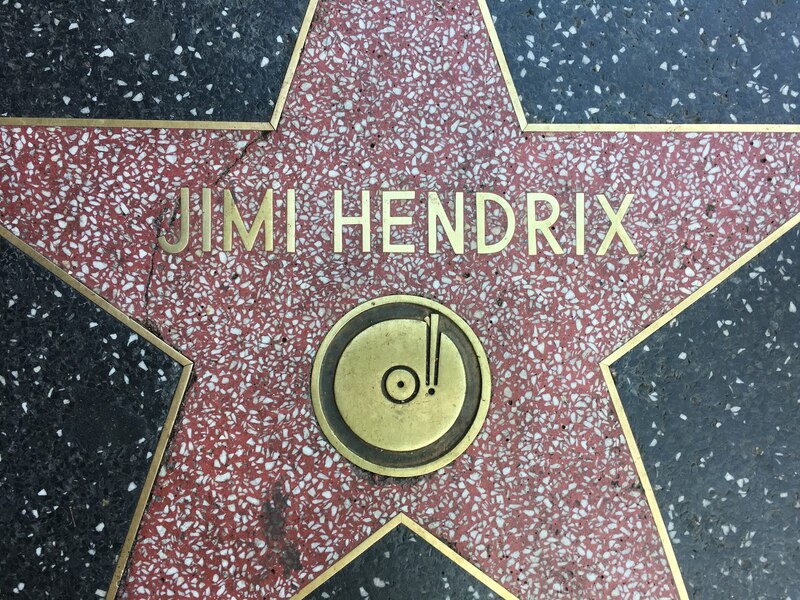 And legendary guitarist Jimi Hendrix. 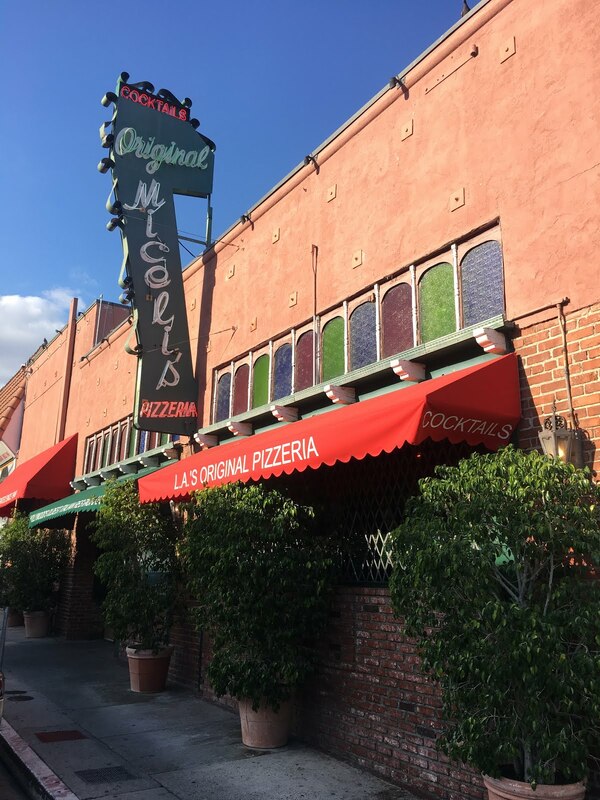 Dinner at Miceli's, a Hollywood institution. Afterwards, my wife and kids headed back the hotel. I wanted to walk around for a few minutes and explore a bit more of Boulevard. Here's a link to the next post on that.